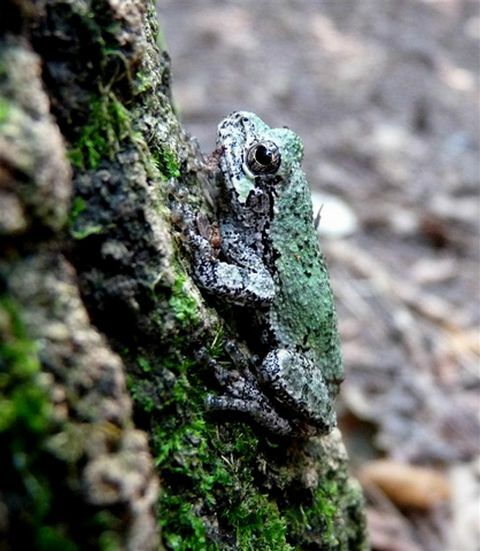 Presqu’ile’s varied habitats result in a diverse population of reptile and amphibian (collectively called herptiles). The wetlands in particular are crucial to supporting these animals. The most conspicuous amphibians are the frogs, and these are mostly detected during their mating rituals when the males sing to attract females. This chorus starts in early spring with Chorus Frogs singing from the pannes along the main road. They start singing anytime between mid-March and early April depending on the thaw. They are soon joined by Spring Peepers and in lesser amounts by Leopard Frogs and Wood Frogs. By May, American Toads and Grey Tree Frogs have joined in. The chorus can be almost deafening and those camping in High Bluff Campground in May have been known to resort to earplugs at night. These spring breeding frogs mostly lay their eggs in the temporary pools of the pannes and forest vernal pools, particularly along Jobes’ Woods Trail. How successful a breeding year these creatures have depends very much on the moisture level in the spring. If it is too dry these temporary pools disappear before the tadpoles can turn into frogs and they perish. Some of the spring breeding frogs will also lay eggs in the marsh but the deeper water of the marsh is where the summer calling and breeding Bullfrogs and Green Frogs lay their eggs. They have to use this deeper water in which to breed as their tadpoles take two years to turn into frogs and thus cannot use the temporary pools. By the time late June rolls around only these latter two frogs are still being heard singing, usually until mid-July. Frogs then become quite scarce until into August, when if it has been a good wet year, the Leopard Frogs that have emerged are hopping everywhere. Leopard Frogs are our only frog species that forages during the day, out of the water, in open areas and thus routinely crosses paths with people. The Owen Point Trail in particular is a good spot to assess how good a breeding season this species has had. In good years it can be hard not to take a step without stepping on a small frog out at Owen Point. The only other frog visitors routinely cross path with outside the breeding season is the American Toad. It, like the Leopard Frog, forages out of the water, but usually only at night. They are attracted to the lights (or rather to the insects that are attracted to the lights) at buildings, and a few toads are usually seen around comfort stations in the campground on summer evening. By contrast, our other amphibians, the salamanders, are rarely seen. They live under logs or deep in the ground in the forest and a concerted search is required find them. Many of the reptiles in the Park are considered Species at Risk. Almost all Ontario’s turtles are considered at risk due to habitat loss and road mortality of adults. The turtles most commonly seen at Presqu’ile are Snapping Turtle, Painted Turtle, and occasionally a Blanding’s Turtles. These are usually encountered in June when the females come up to the roadsides to lay eggs. It is crucially important to watch for these turtles when driving through the Park and elsewhere to avoid killing them. 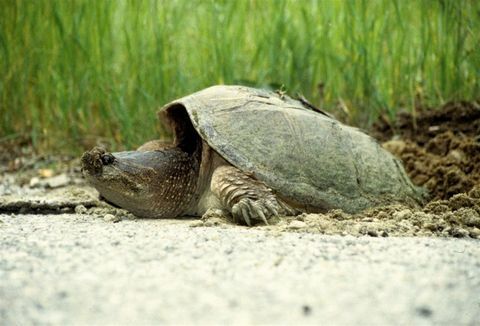 Loss of breeding adults is resulting in local extinction of turtles near roads throughout Ontario. Snakes are also vulnerable to road mortality, particularly so in the cool spring and fall, when they come out on the road to bask. Every year snakes are killed in the Park, including the Eastern Milk Snake, a Species at Risk. Please drive with caution in the Park. The most common snake seen by far is the Eastern Garter Snake. It can be found throughout the Park during the spring, summer, and fall. Owen Point Trail may be the best place to see them (they are no doubt chasing all those Leopard Frogs). The next most commonly seen snake is the Milk Snake, often around Calf Pasture. Red-bellied and Brown Snakes are no doubt more numerous than Milk Snakes but they are small and retiring and rarely seen. Most records of them come from sunny autumn days when they come out to warm themselves after a cool evening.